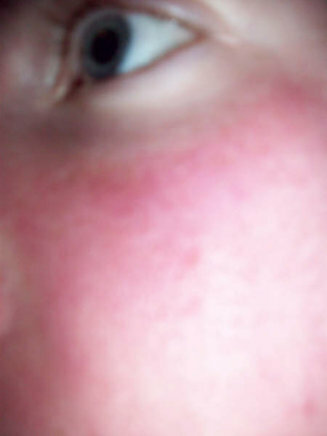 Pictures of cholinergic urticaria often show the pinpoint hives, redness, and wheals. Not every individual with cholinergic urticaria will experience visible symptoms during a reaction. The individual may just feel a strong itch and sting feeling when they become heated. Other times, cholinergic urticaria may present with various visible symptoms, which generally only occur during the actual hives response. These visible symptoms may vary, and some individuals may experience only the intense itch and prickly sensation, and may not exhibit visible symptoms at all. Others may exhibit very dramatic visible symptoms during a reaction. Additionally, factors such as skin color, skin thickness, and skin tone may mask (or reveal) these visible symptoms. Another interesting fact is that while some individuals may exhibit very visible symptoms, they may not necessarily feel very much itching or pain. Others my have little or almost no visible symptoms, yet feel an excruciatingly painful sting and itching sensation. So the visible symptoms do not always match the level of intensity experienced by the individual during the hives reaction. 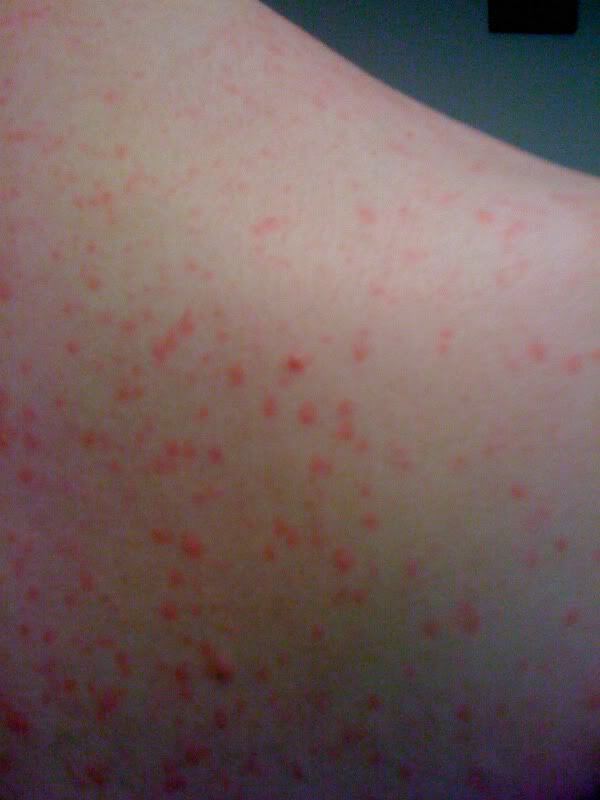 The common visible symptoms (when they present), are often flushing of the skin (in a red or sometimes blotchy appearance), small goosebumps that are raised during the reaction, small pinpoint hives (often red in color), and sometimes small wheals in areas scratched by the individual. The pictures below represent some visible symptoms an individual with cholinergic urticaria may experience during a reaction. You can also watch the video below for a quick recap of this article. 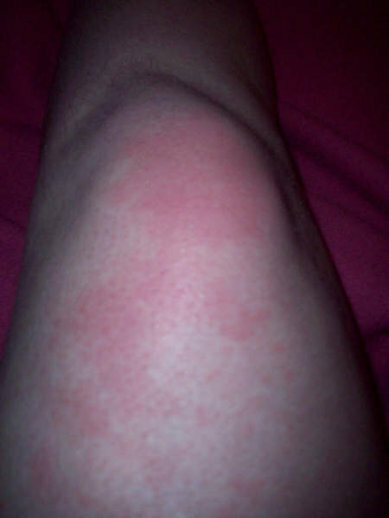 It seems this picture was taken during or shortly after a fairly strong reaction of cholinergic urticaria. The skin does not look like this at all times for cholinergic urticaria sufferers. The skin will look normal unless a hives reaction is initiated. Also, the small pinpoint hives in the picture above may not always appear unless the attack is a fairly strong reaction. Some cholinergic urticaria sufferers may not see the small pinpoint marks at all. They may only feel the itchy/prickly sensation along with flushing or small wheals from scratched areas. Notice how the entire surface of the skin has a red “blotchy” look to it. This is what doctors will sometimes refer to as “flushing.” This is where the skin has the appearance of a red, blotchy, or rash-like appearance. This is exactly how it looks many times when the body starts to go into a heat hives reaction. 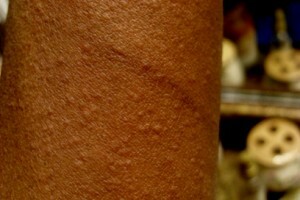 If the person scratches the skin during the reaction, bright red scratch marks may also appear. The skin may also be accompanied by what is called “wheals.” Wheals look like a raised scratch mark. Large wheals are not common in cholinergic urticaria, and are generally faintly visible. Also, notice how the raised pinpoint hives are randomly popping up. These hives are usually very small (about the size of a small mole or pen point). They do not always appear, but when they do appear they are usually randomly spread out over the areas where the itching occurs (the trunk, face, neck, arms, etc.). I personally get these small bumps pop up as pictured above during really strong reactions. They will usually mysteriously disappear within minutes, leaving no trace or marks on the skin. This is a very severe reaction I had one day. I usually don’t get this red, and don’t even always see the red pinpoint hives. At the end of the reaction, I could see some very, very small red hives. They are hard to see in the picture below. They are not very noticeable, and in fact I never realized I had them until I really started to look closely at my skin during the most intense reactions. They are few and far between, pop up randomly, and are about the size of a pen (take a ball point pen and make a dot on your skin). 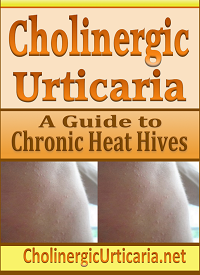 The picture above shows the very small and numerous hives that can occur during a cholinergic urticaria reaction. These are normally red, but sometimes have the appearance of “goosebumps.” They often appear during stronger reactions, and disappear completely once the reaction is over (which is usually only minutes). Photo credit: Klope62. These pictures were submitted by member WillDev, who not only made a great introductory post with lots of useful information, but was also nice enough to share several pictures with us. As you can see from the pictures below these are rather large hives for cholinergic urticaria, and look much larger compared to the kind I sometimes develop. Keep in mind that the size and type of hives often varies from person to person. As you can see, this is a pretty strong flushing reaction. This occurs with many types of hives and/or allergic responses. I also just want to briefly say that I am NOT a doctor. Please do not confuse anything I say on this website at medical advice. Period. You should always consult with a medical doctor before trying any medications, or stopping any medications.